IR took the team title out of 19 teams in the tournament, posting a 41-32 win over Dunbar in the finals. It avenged an earlier 41-26 setback — the lone loss of the weekend — for the Indians. “We took a very tough loss to Dunbar to start the tournament, but the team responded very well in the next four matches in our pool,” head coach Jeff Windish said of his team’s performance. “The 4-1 record secured a spot in the championship bracket, and a semifinals match-up with Owings Mills,” he said of pool play. At the time of the duals, Dunbar was the ranked 16th team in Maryland, while Owings Mills was the 10th ranked team in the state. After the opening loss to Dunbar, the Indians rattled off wins over Pennsylvania’s Martin Luther King (54-24), Maryland’s Lansdowne (36-33), D.C.’s Woodrow Wilson (58-18) and Maryland’s Patterson (72-12). The win over Owings Mills came with a little bit of excitement. The Indians picked up the decisive one point, and the 37-36 win, to earn the rematch with Dunbar, in which the Indians were victorious, 41-32. In the semifinal versus Owings Mills, Will Rayne pinned a returning state champion to keep the Indians’ momentum. For his efforts on the weekend, Rayne was named the tournament’s Outstanding Lightweight Wrestler. He also defeated a returning state runner-up. 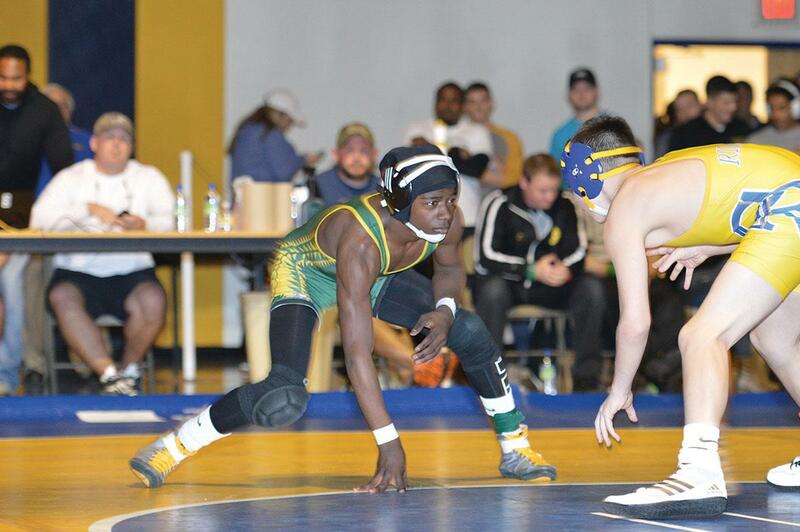 Zach Schultz, Ian Shaubach and Ta’Jon Knight each went 7-0 over the weekend. Knight also defeated a returning state place-winner amongst his wins. The Indians stayed perfect in the Henlopen Conference South Division dual-meet portion of their schedule with a 44-27 win over Lake Forest last Wednesday, Jan. 9. Six different Indians posted win by fall amongst the eight individual matches won in the contest. Shaubach, Rayne, Knight, Schultz, Jacob Grab and Ramond Turner each picked up pins to help the IR cause, while Reshawn Turner added a 12-6 decision at 152. The biggest win of the match may have come from junior Cristian Lopez at 126, when he cruised to a 15-0 technical-fall victory. “Cristian Lopez stepped in to the varsity lineup and came up big with that tech-fall,” Coach Windish noted. “Rayne and Knight then moved up and got us crucial points. The Indians are now 11-1 overall in their dual-meet contests and 4-0 in the Henlopen South. They were set to host defending state champion Milford on Wednesday, Jan. 16, after Coastal Point press time. It is a vital contest for both teams as they look to lock up the divisional crown. Results of that contest will be posted to the Coastal Point sports Facebook and Twitter pages. IR will be competing in the Franklin Invitational Tournament at Franklin High School in Reisterstown, Md., this weekend, Jan. 18-19.